At his core, PCT Communicator editor Mark Larabee is an outdoor lover. He plainly admits that he would rather be out hiking, rock climbing, bicycling or playing in the water than anything else. He took his first hike on the Pacific Crest Trail in 1990 in the Ansel Adams Wilderness, in California. Larabee concedes that he didn’t know much about the trail back then, but says that it was an amazing introduction to hiking in big wilderness. As he became more acquainted with hiking portions of the PCT, it was consistently part of his annual hiking plans. Since that first PCT hike, he has continued to discover more and more of what the trail has to offer in both the Sierra backcountry and the Cascades in Oregon and Washington. How did you come to be the editor of the PCT Communicator? 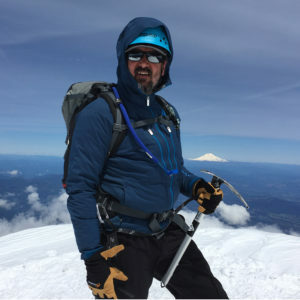 Mark Larabee on the summit of Mount Hood. 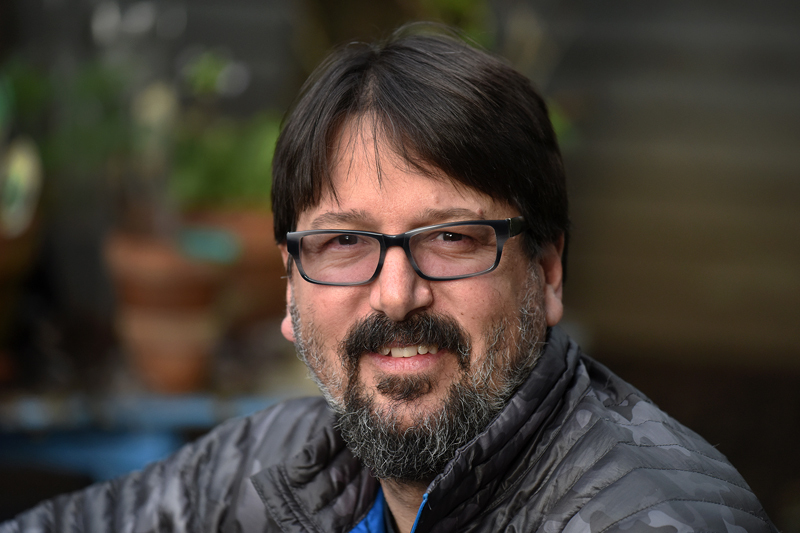 Larabee: I was writing for The Oregonian in 2005 when I proposed a project about the Pacific Crest Trail; how it was financed and maintained, and how it was taken care of by volunteers. We researched the series for four months and then hiked across Oregon for a month. We wrote 13 stories for the print edition of the paper and daily blogs—we called them web blogs back then. My newspaper job went away in 2009, so I started doing some freelance writing and consulting. 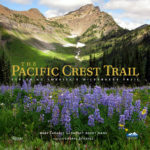 In 2010, the Pacific Crest Trail Association (PCTA) hired me as a contractor to edit its magazine and do some communications work. It was a natural fit since I’d done the newspaper series. PCTA offered me full-time work in January 2017 as its associate director of communications and marketing. What do you enjoy most about your work with PCTA? Larabee: The PCT is an amazing trail that runs through some of the most beautiful and isolated places in the West. The fact that it’s there and that I get, in some small way, to make sure that it remains there for future generations, is an incredible feeling. Even though my first love, newspapers, will never be what they once were, I still feel like I’m in the fight for what’s right. The PCT and our public lands need strong advocates and champions. I’m humbled by the responsibility and I feel lucky that my second career is a worthwhile cause. How much of the PCT have you hiked? Do you continue to hike it? Larabee: I’ve probably hiked about 900 miles of the trail between its three states. Roughly 500 of that was when I crossed Oregon for the newspaper. I’m not a thru-hiker. It’s not appealing to me. But that’s the beauty of the trail, you can get out there for a day or a week or whatever. The PCT is readily accessible from my home in Portland, so we regularly get out to hike portions of it in the Columbia River Gorge, or snowshoe the trail on Mount Hood. Where does the PCT stand with current threats to public lands? Larabee: The trail is as apolitical as it gets. Hiking and horseback riding are not political activities. The people who support the PCTA, who volunteer to take care of the trail, who donate money to us, come from all political backgrounds. The trail’s supporters in Congress come from both sides of the aisle. We are grateful for that. Our supporters understand that the trail and what it offers rises high above politics. When I was writing about the PCT for The Oregonian, one PCT volunteer told me that he thought the trail was the great equalizer. That’s always stuck with me. What can hikers do to help ensure that the PCT is accessible for generations to come? Larabee: You can get involved. You can go to our website and become a volunteer. We have many projects coming up that need your hands. We’ll train you and feed you and give you the tools to do the work. Just show up. Our volunteers gave more than 104,000 hours in 2016. That’s huge. You can also join PCTA. By becoming a PCTA member, you can put your money toward a worthy cause. We leverage your money and marshal hundreds of volunteers. We advocate for the trail with Congress and with the land management agencies to ensure that the trail is considered and not forgotten. This trail has always been a project of the people. There’s no better time to get behind something you believe in. We welcome your help and support, and we need it. 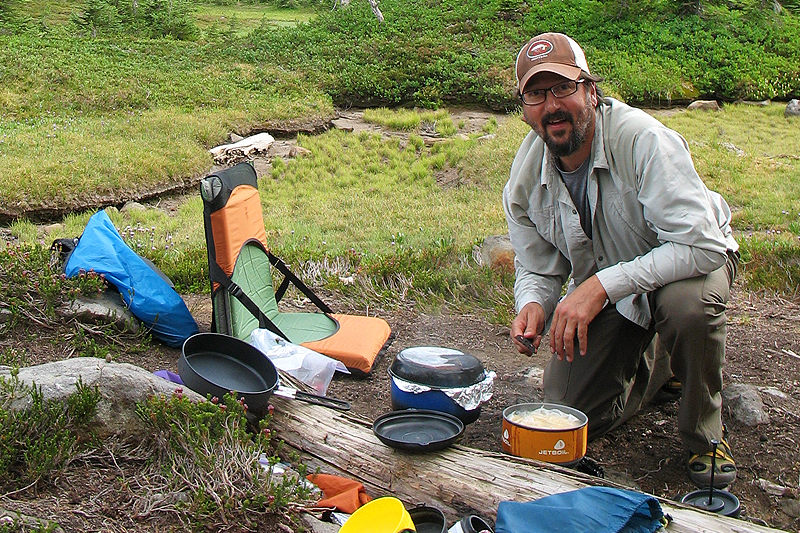 Mark Larabee, editor of the PCT Communicator, enjoying camp on the PCT in Jefferson Park.